Be a Star with the Fastest, Strongest, most simplest mini ESC in town. Damped Light (Active Braking); OneShot125 Enabled with a Jumper. Each unit is powered up at RTF to check for working order. We want to make certain one is getting a working product when it leaves the door, get in the with no delay with DOA ESCs. Open: Low Pass Filter - ON High-frequency spikes will be filtered for some degree to prevent damage to the ESC and motor. As long as the flight style is not hard fast acro, you will not notice the low pass filter. We recommend to keep the filter ON for most setups, turn it OFF only if you know exactly how the PID FC is set for your specific setup.The low pass filter prevents the overheating due to variations in the input signal, but also reduces the speed of the throttle reaction at strong signal changes. Closed: Low Pass Filter - OFF Control behavior of the Star ESC is just as sharp and good as in the previous 1.1 software version. 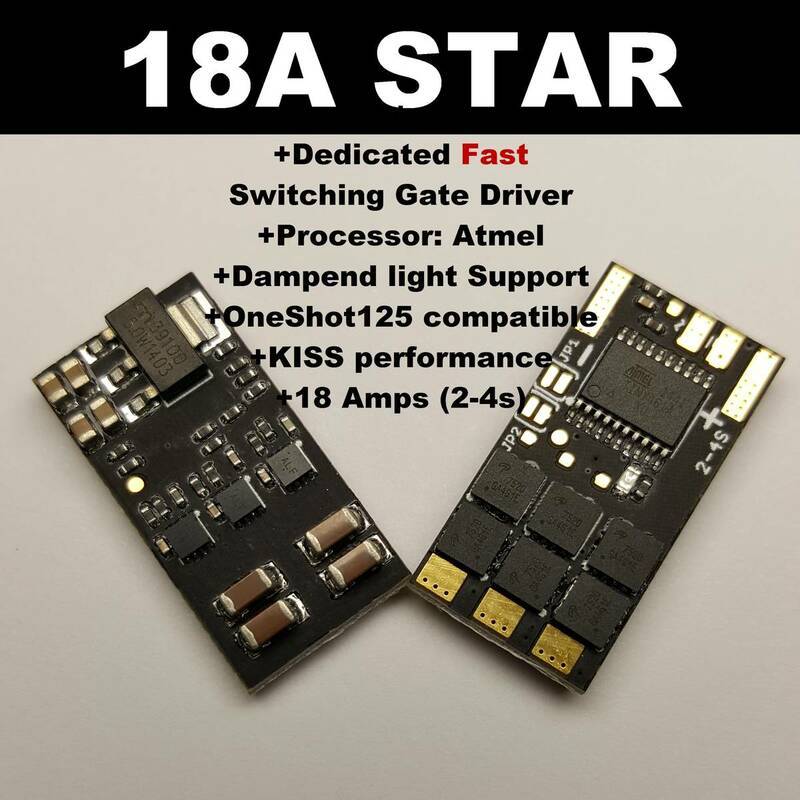 The STAR ESC, the 18A Version use higher rated fets which are able to withstand higher currents compared to the 12A Version. Hardware and Software are developed for each other, all Parameters are optimized, we are sure you won't find another similar sized ESC which stays as cool and react as fast as this ESC at the same Amperage draw. Blazing fast SW/HW integration you get some real performance. High Pole count Motors aren't a problem too for this ESC too. RPM up to 42000 are supported based on a 14 pole motor), which is simply amazing. 300.0000 rpm (2 pole) are no problem for the starESC and never had been.The use of real gate drivers which work perfectly with the selected Fets, have performance benefits in many regards compared to other common designs of small ESCs.Unlike most other ESC we use dedicated hardware parts which are made for their use of an beeing an ESC instead of beeing a general use CPU ( Silabs,Atmega8 series) which have to do all in the software. 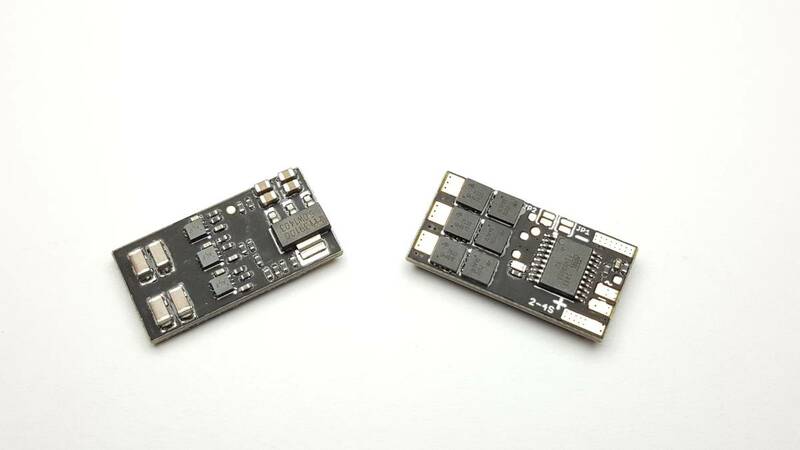 Oneshot125 ( introduced 2012 for the first time to the multicopter world with the UltraESC and now widely adapted) is an alternative PWM throttle Signal, its 8 times faster than the Standard 400-490 Hz signals. It is ment to be sent instantly after each FC control loop to have the fastest possible ESC Response. Do not mount the ESC directly on conductive material such as carbon fiber or aluminum, take care of which power distribution you use, always check with a multimeter for shorts and take in account that some PDB (not realated to us, not our designs) can cause a electric short after some use due to isolation problems between carbon arms and the PDB centerplate caused by a wrong desing (again not at all relatred to us, just a hint so can take care for). Depending on the configuration, GND connection needed on the signal cable from the FC.For 3.3V CPUs (ARM Cortex F1,F3,F4 for example), clean GND reference can be useful and is recommended, so use the GND Pad on the ESC (for the Star 30A we have a extra signal enhancer included so it behaves different and normally dont need a extra GND clean reference, but it cant never hurt anyway). This ESC is made for fast reactions to signal changes needed for multirotors unlike old ESC designs so please take care for your PID tuning, there are many variabes we cant overview, the input filter on the 1.2 Version should give you a safety barrier for too noisy input signals, if you know what you are doing you can disable it by a solder jumper and enjoy slightly faster responses (this is an automatic averaging filter, in most situations you wont feel him anyway and simply dont need to care). problematic can be a too soft arm in combination with too high values for in first P and D (of course also in I relation), as the FC then have something to counteract, quite quick, which our ESC (especially quick) do but this cause unecessary ampere spikes which stress the equipment.